Time is shooting past isn’t it. Danella, aka The Official Photographer, went back into hospital and finally, almost eleven months after the initial accident had all the screws, broken and entire, removed from her leg. The steel plates however are left in. Due to the extraordinarily long wait period, Danella was booked into a private hospital. We reported to Mercy Hospital at 9 am on the 21st and she was checked in and ready to go off with her handsome American surgeon within the hour. I received a call from said handsome American surgeon an hour and a half later, immediately following the surgery and given full details of what had been done. We had a prolonged and congenial discussion about whether he was a surgeon or a car mechanic after he described having difficulty getting one of the screws out from behind the metal plate and having to use his screwdriver to ‘ping it up’. It was an almost shocking juxtaposition from the event a year earlier when the Dunedin Hospital had lost my daughter for two hours and no-one could tell me where she was or what was happening to her, followed by the lack of communication over what had been done to her in surgery. I was incredibly impressed with the quality of care and attention given by the nursing staff at Mercy and by the calm, serene ambience of the reception and the ward. She was well tended to by her nurse throughout the day and I was encouraged to be there, and be fully informed throughout the process. By 4 pm that day I was driving Danella back home and tucking her in. Within two days she was up and about and caring totally for herself and was back at work a week later, having been at my place the day before cleaning my hard to reach windows. 🙂 It was, all in all, a really great experience. I do love it when life serves us up the very best possible outcome and puts bells on it too. We’ve been enjoying some lovely weather. Siddy and I took it into out heads to take an extra walk in the evenings as dusk was falling and the streets were a bit quieter so he could practise his off leash walking. Orlando took it into his head to come with us, each night coming a little further. So there we were last night, all three of us, heading off for a stroll round the block. I say ‘stroll’, but the thing that got me was that the puppy became quite serious when he saw that the cat stayed with him. He didn’t stop to pick up or leave messages as usual, but trotted along, not deviating from the path as is his usual style, as if he needed to get his kitty back home safely as soon as possible. The kitty trotted along just behind Siddy, tail held high and clearly not bothered. I was quite puffed as we completed the block in record time. I’m kind of hoping it doesn’t become a regular occurrence and I kind of wished The Official Photographer could have accompanied us, it must have been quite a sight. 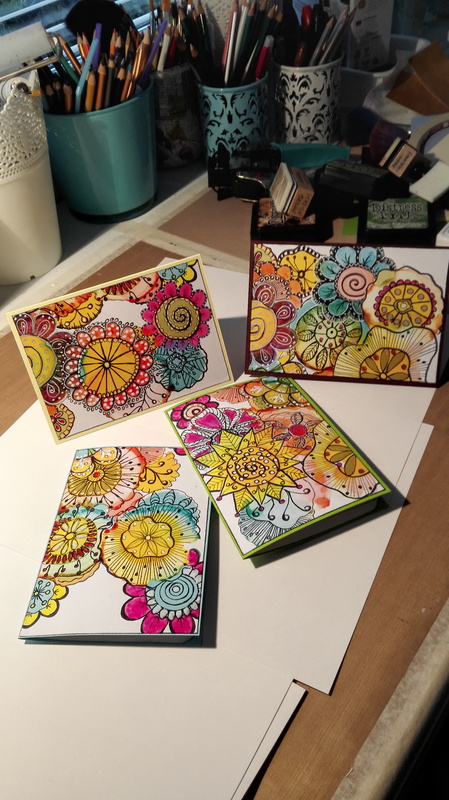 I’m still managing to create at least one card every day and a series gets completed in about three days. Here’s a few of them. I do love my owls These are fun and will appeal to certain people in my circle of friends and family This one isn’t a card, I made it for me to put on the fridge just to remind me I don’t need to buy any more crafting supplies – I gave myself an intervention 🙂 I’m not sure if it’s worked….. 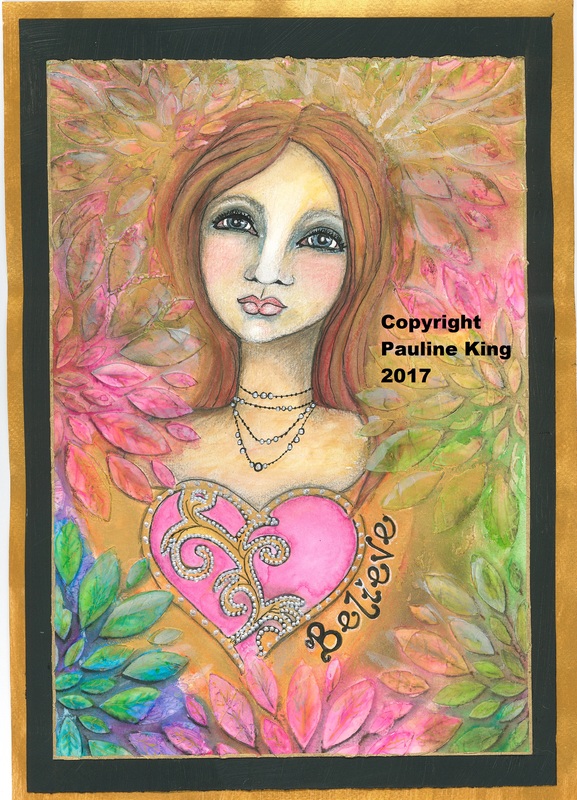 I designed a Christmas card and blinged them up with an increasing amount of diamantes and glitter, which you can’t see here, but believe me they sparkle and shine – these are just the first two, there’s several more…. Then, with the next series, the pets got in on the act Somewhere along the line I found some unused inky splatter backgrounds and added these gnomes to them – this made me happy! They are so useless and cute and I must make more And to finish a design still in process That’s it, that’s October almost done and dusted. Is it seven weeks til Christmas? Here’s Siddy getting his aunty Jo’s bed ready for her Christmas visit. If you look closely you might catch a glimpse of his ‘Superdog’ harness. He’s looking a little porky on account of too many treats, so not really capable of flying ……… Thanks for coming by today, I love that you did. 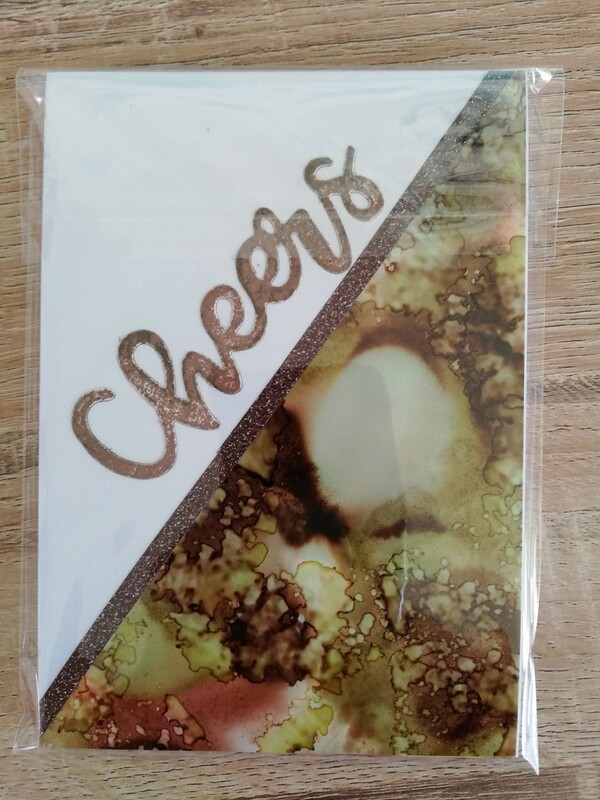 Do you remember a couple of posts back I mentioned a give-away? 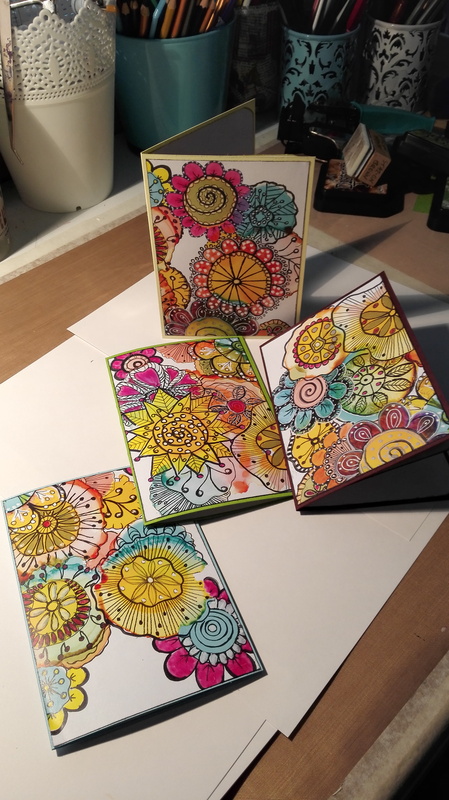 And where I showed you the beginning processes in the creation of my new line of Note Cards. 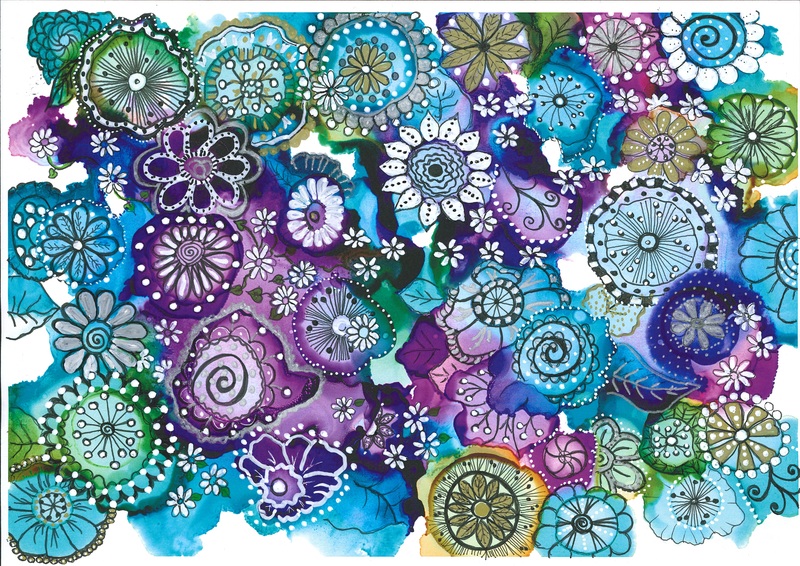 Yupo paper, alcohol inks and hours of doodling went into completing four A4 sheets. Each sheet was then cut into four pieces and, when the note cards were all made up there is a grand total of 16 different designs. 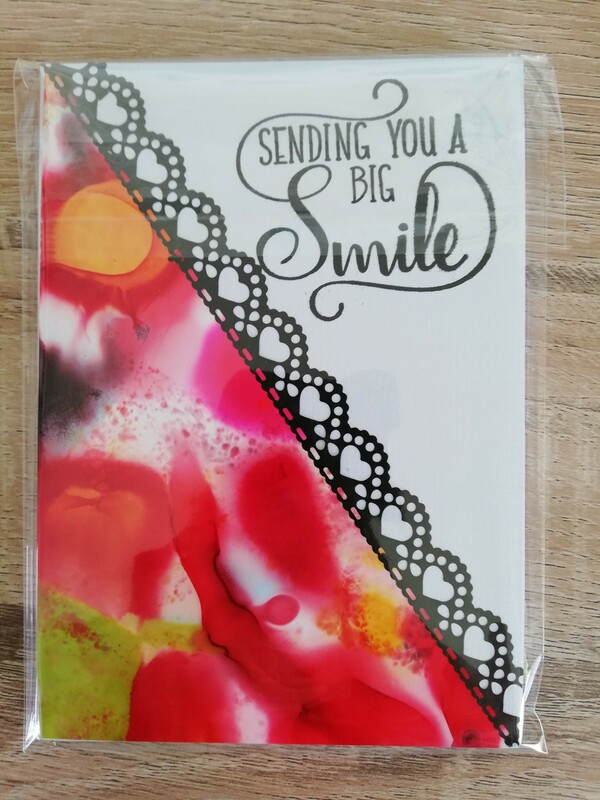 You can use any card upright or top hinged, it is purely personal preference. Every A5 note card comes with a writing paper insert, allowing you to write fully on three leaves. After much experimentation and contemplation I decided to stay with white card and ordinary printing paper for the inserts. It was simply easier and more affordable. Every note card is hand made by me. 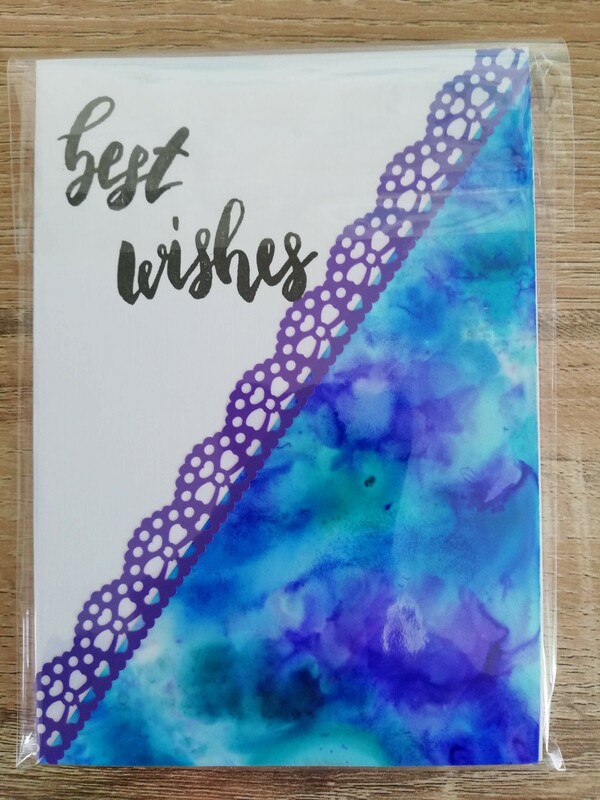 I cut the card, slice the original design into four and trim it to fit the card. I ink the edges of each little printed design. 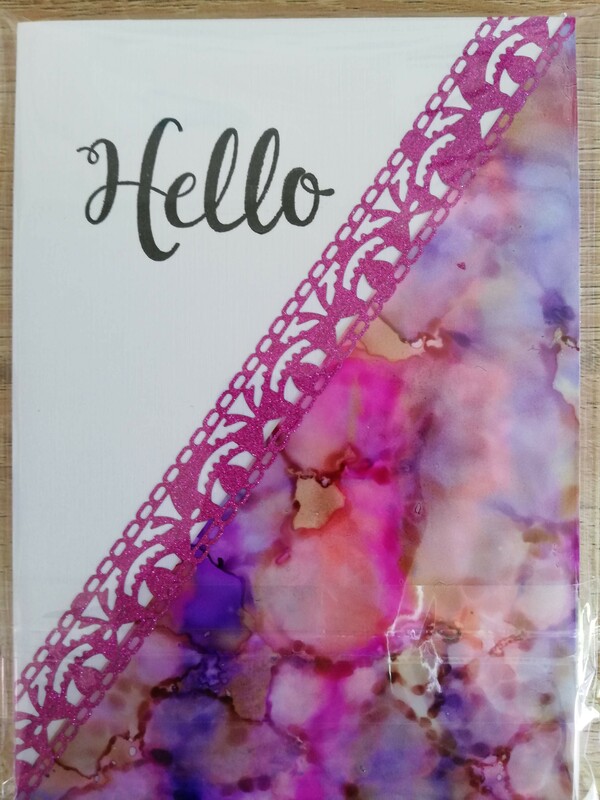 I alone score, crease and fold the card into shape, wrestle with my double sided tape gun (which is being extremely temperamental at the moment) and adhere the card and printed paper together. I then cut the paper insert to size, trim and finally adhere that inside the card. Slight variations and imperfections are inevitable. Now to the give away. 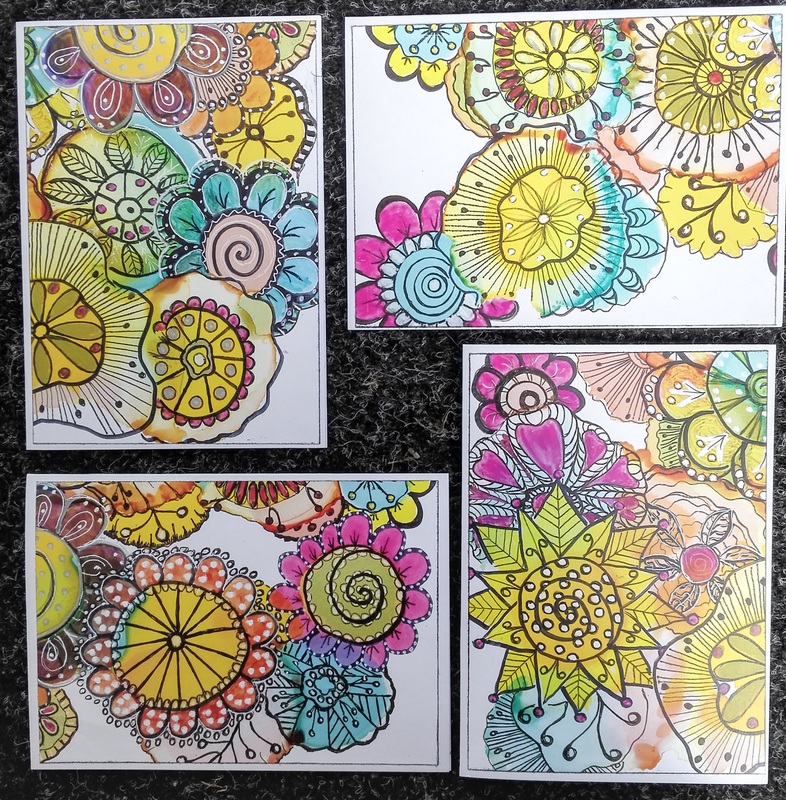 Which isn’t really a free thing at all, I’m asking for your advice and in return your name goes in the draw for a set of note cards, design of your choice. So, to enter you must humour me and help me solve a terrible conundrum. Please do read on if you want to play……. 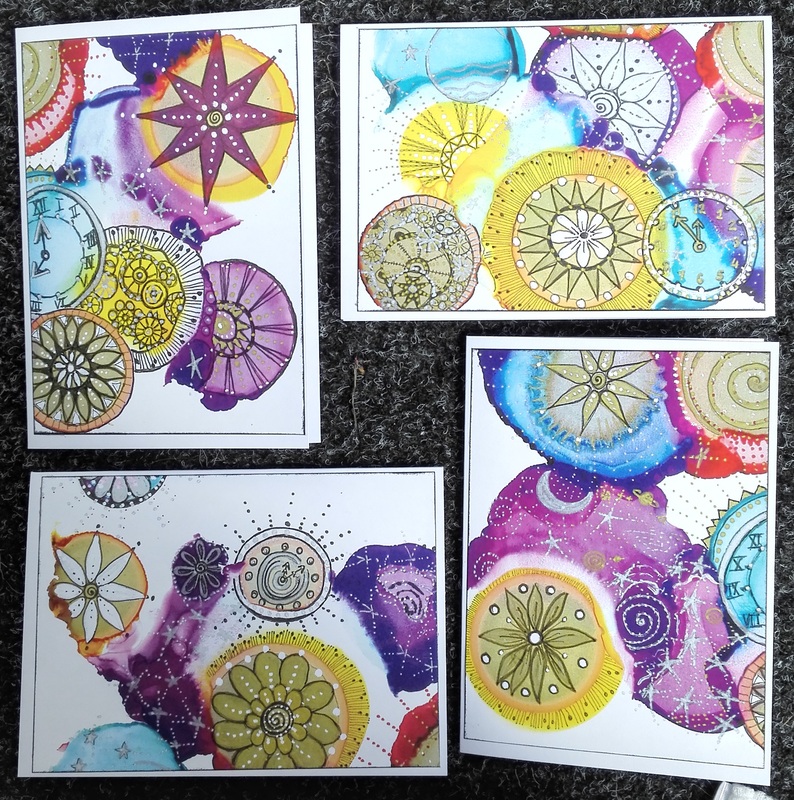 Will you pretend with me that you want to purchase a set of four note cards. 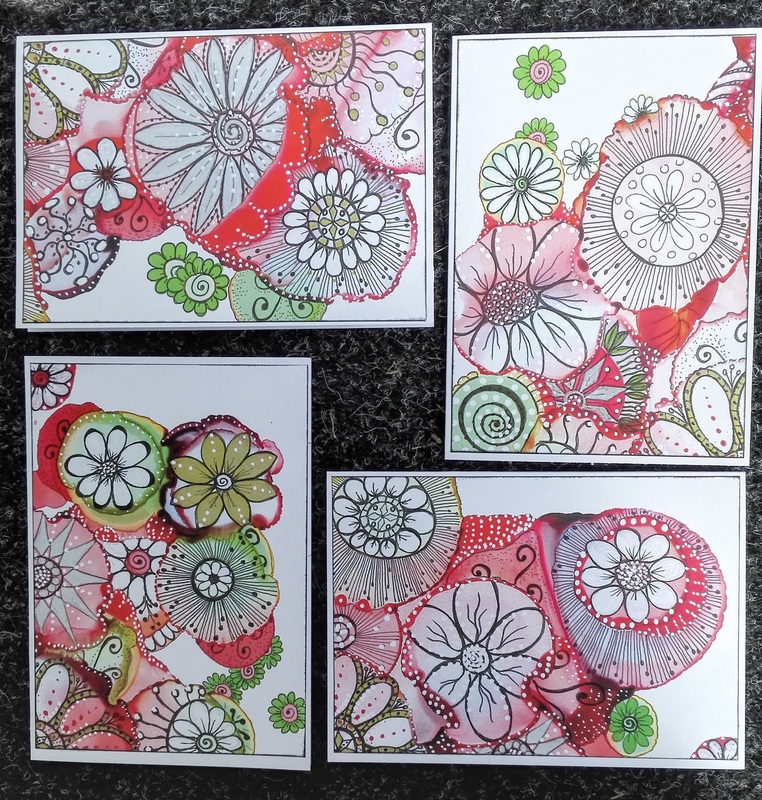 You are ready and champing at the bit to get into letter writing again, these doodly cards are the perfect size for a chatty and cheerful note to get the ball rolling. You feel that the cost of $NZ17 is affordable, you know, that’s just $4 per card and 25c per envelope, cheaper than most mass produced cards. You discover that four note cards with envelopes costs $17 + $15 shipping for International customers and $5 shipping for domestic customers. Suddenly the cards from the corner store are looking way more appealing! The thing that pushes the cost up is the size of the envelopes, they take the packet from letter rate to small packet rate, which is the same rate I send small light catchers around the world for. And there’s a big difference in size and weight between 4 note cards and a triple strand light catcher! So what if you just bought your own envelopes from the local store? Four note cards with no envelopes costs $16 + $3 shipping – anywhere in the world. Do you have a favourite design or colour way? Wow, lookit me go! It’s still January and here’s another post! I hope it won’t be too much of a shock for you. I’ve been pottering, and the silver lining to the no-show summer is (Ta-da!!) the tiny house has now been entirely decluttered. I mean ENTIRELY! There is nothing in this house now that is not useful or beautiful and probably both. The laundry was the last space holding onto ‘someday’ things. The last drawer has been sorted and tidied and there is nothing left to do now but keep it all ticking over nicely. Can you see my halo, isn’t it bright and sparkly …….. 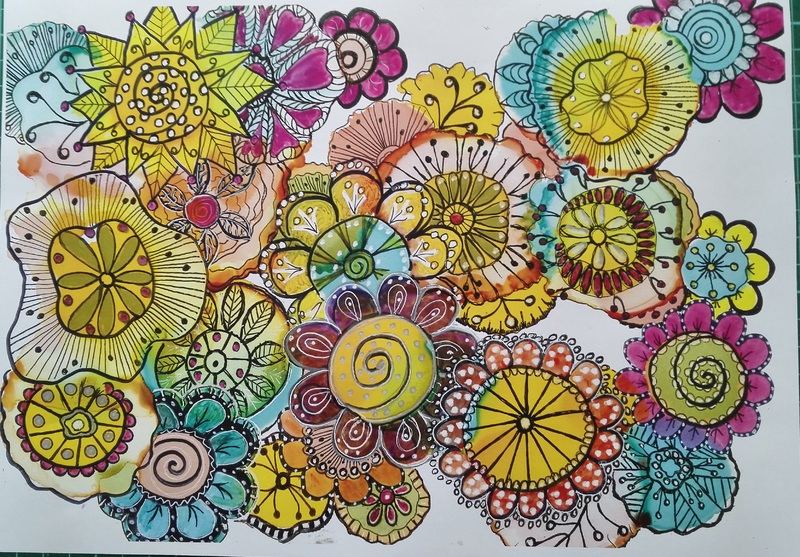 I rocked up to my local stationers a couple of days ago and had them scan all twenty of the pieces in the art journal I worked on for the last three months of 2016. 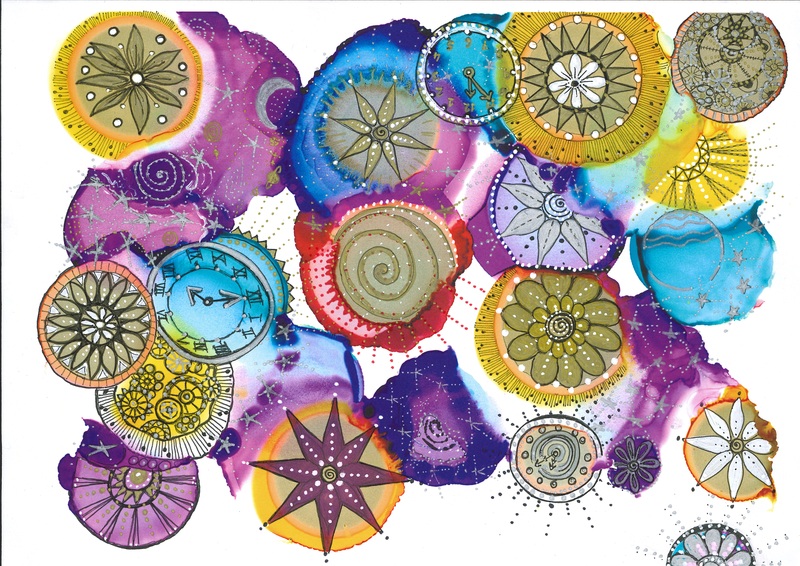 Plus print out copies of all the yupo paper/alcohol ink pages I had made. 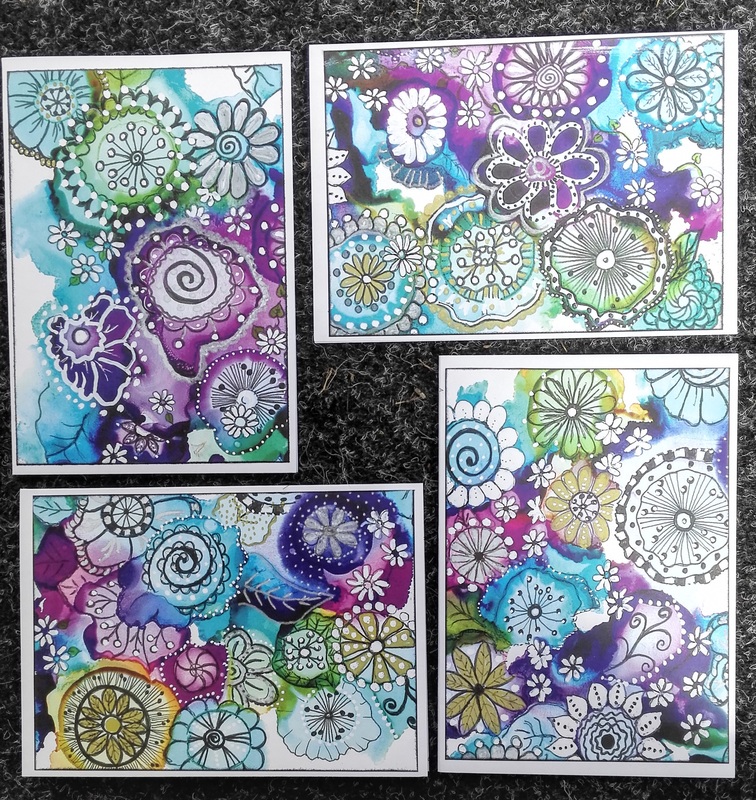 I’d decided to copy the ink spreads and then doodle so that I have lots of options to play. Did those last two sentences sound like a foreign language to you? Read on my friend, read on. Yupo paper isn’t paper, it’s a synthetic, a plastic pretending to be paper. It is therefore classed as a non-porous surface and things can be done to this stuff that can’t be done on paper, no matter how many gsm’s it is. It’s also, at this end of the world, horribly expensive and something I intend to try only once in this life. Hence the photocopying before doodling remark. I treated myself to fifteen sheets and waved a fond farewell to $25.00. 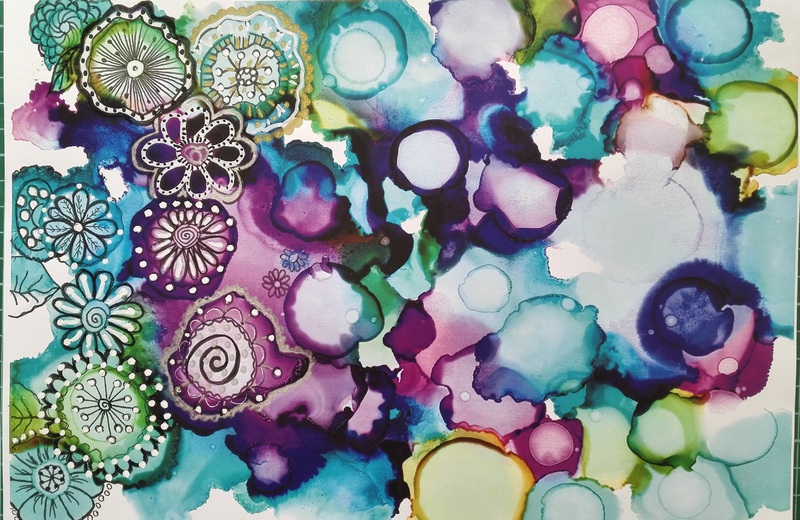 One of the really fun things we can play with is alcohol inks, dripping drops of different colours onto the page and watching what happens. 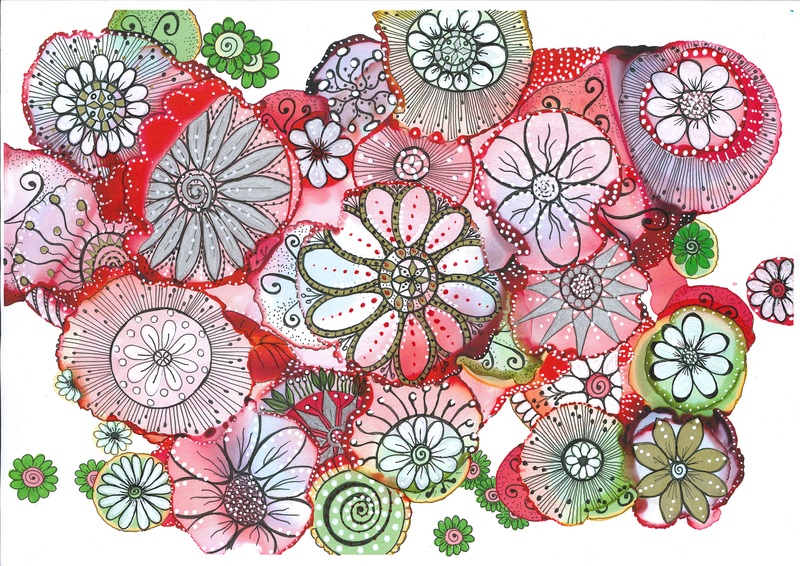 The ink spreads out and ‘blooms’, changing colour somewhat at the edges, more with some colours than others. 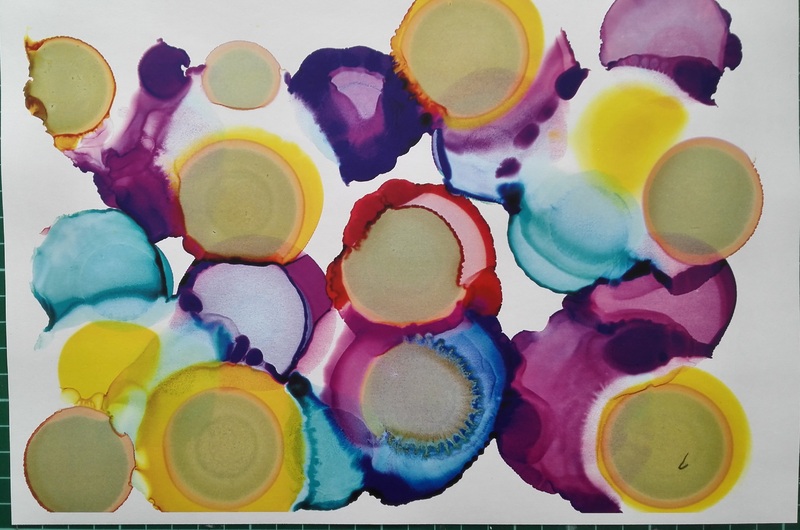 Mixing different colours together results in different spreadings, different blooms, and sometimes even no blooms. It’s like taking part in some mysterious class in alchemy and is totally fascinating to observe. And here is the only spread that is finished so far. I’m not complaining though, we had three lovely sunny, warm days on the trot. It was quite exciting! I have to say I really like these notecards, and in the interests of encouraging the renewed interest in letter writing, I’m going to package some up and put them in my shop. And do a giveaway. Stay tuned for that. This is a texture rich piece and there’s also a ton of gold metallic paint in there so it looks entirely different in different lights. This is a slightly skewed scan, which is entirely unexciting as far as mood lighting goes. You must therefore use your imagination to see all the gold glimmery bits. Sorry about that. I’m quite pleased with this one. 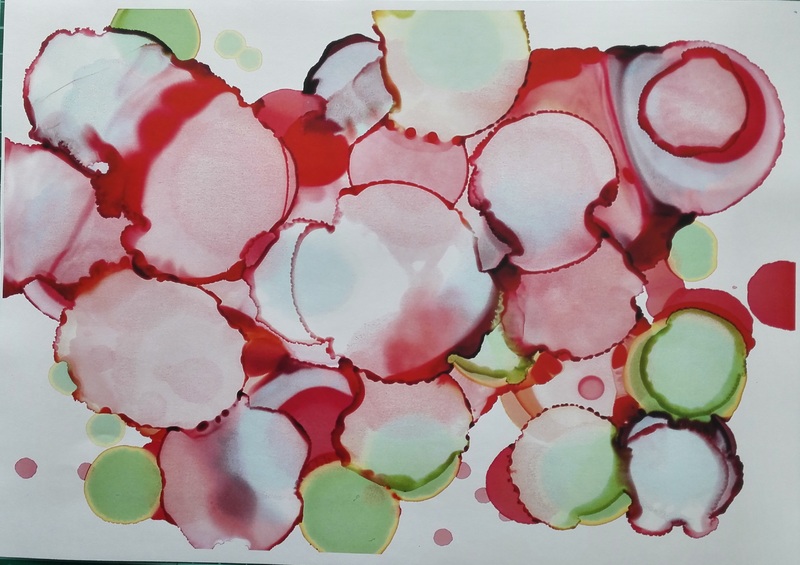 So what do you think, are you tempted to play with yupo paper and alcohol inks? Have you done so already? How did it go for you? And what do you think of those notecards?